Sea cucumber is a premium product with large popularity in China, the largest producer of this seafood and its related products. The Chinese sea cucumber farming industry showed an overall stable trend in 2017. Farm-gate prices have continued an upward trend in the past two years. Production volumes and stocked amounts have also increased significantly. Total production of sea cucumber in China amounted to 200 000 tonnes in 2017. The provinces of Shandong, Liaoning, and Fujian led the national supply, contributing with 100 000 tonnes (50 percent), 70 000 tonnes (35 percent), and 20 000 tonnes (10 percent), respectively. The Hebei province produced 10 000 tonnes, while other provinces accounted for the remainder 5 percent. In 2017, the total output value of sea cucumber products reached nearly CNY 30 billion (USD 4.44 billion*) in China. Shandong reported the highest yield in domestic sea cucumber production, while Liaoning is recognized for the highest quality. 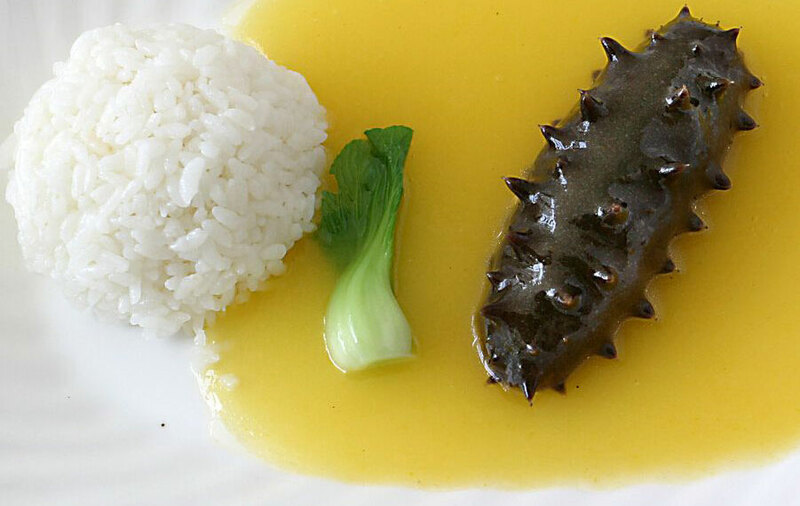 Fujian is becoming the emerging production base of sea cucumber and consumer markets. Sea cucumber in the north is mainly farmed in seawater ponds or using bottom culture in coastal areas. The aquaculture production in the north was stable, due to several factors. First, the downward trend of sea cucumber price since 2011 reached a minimum in 2015, and has since increased marginally improving the market conditions. This discouraged the shift of sea cucumber rearing ponds to other species. Second, the approval of marine projects slowed down or ceased due to ecological and shoreline restoration policies by the Chinese government. Third, polyculture technology has largely developed in recent years. Traditional ponds used to produce sea cucumber can now accommodate other species, such as shrimp, jellyfish, and bivalves. In the south, the sea cucumber farming in the Fujian province has recently slowed down. Sea cucumber rearing in this province reached a peak of 150 000 operating cages in 2015. In 2016, the farming dropped to 120 000–130 000 cages due to increasing costs and it has remained the same through 2017. This drop in Fujian during 2016 and 2017 was a result of several causes. The retail price in this province plunged from CNY 140–160 per kg (USD 21–24 per kg) in 2015 to CNY 74 per kg (USD 11 per kg) in the first half of 2017. In addition, the output of sea cucumber rearing was lower than expected due to low reproduction performance. The price of juvenile sea cucumber increased by almost 50 percent from 2015 to 2017. These increased prices brought back to business some hatcheries that had previously stopped running in Liaoning, Shandong and Hebei provinces. The stocks of juvenile sea cucumber climbed sharply in 2017 averaging 347 055 pieces per ha. There were outbreaks of disease in some areas due to low temperatures in the spring and high heat in the summer, so supplementary stocking was carried out. It was speculated that because farmers stocked higher amounts, the hatcheries sold juveniles with smaller gauge. In 2017 the annual average farm-gate price of sea cucumber reached CNY 116 per kg, 18.4 percent and 21 percent more than the price in 2016 and 2015, respectively. Throughout the year there was an upward trend in price from the spring to the autumn season. During 2017, China registered a remarkable increase in total production cost totalling CNY 176 million, 57 percent more than in 2016 and almost double than in 2015. The average production cost reached CNY 80.6 per kg in 2017, an increase of 32 percent and 64 percent compared to 2016 and 2015, respectively. Even though the number of sea cucumber farms is not expanding in Liaoning and Shandong, the stocked amount of juvenile sea cucumber in 2017 was relatively high and therefore landings in 2018 are expected to increase slightly in these two provinces. The new batch of juveniles added in October 2017 is expected to maintain higher survival rates and it is therefore forecasted that the total landings in 2018 will reach 20 000 tonnes in Fujian on par with the 2017 output. While the prices of bottom-cultured sea cucumber are expected to reach around CNY 200 per kg or higher since both the production and harvest cost are much higher comparing with other aquaculture types. The prices of sea cucumber reared in ponds and cages are predicted to stabilize at around CNY 70–80 per kg in Fujian, and CNY 120–140 per kg in the north of China. The ecological hatchery in seawater ponds and the Integrated Multi-Trophic Aquaculture (IMTA) technology will be further established and promoted, especially in Liaoning and Shandong. Currently, sea cucumber-oriented IMTA has contributed with more than half of the total farming area, an increase of more than 30 percent compared with 2016. Sea cucumber aquaculture performance is affected by environmental factors or human activities. The natural sea environment is crucial, according to the monitoring results in Liaoning and Shandong during 2017; lower rain levels in Liaoning and Shandong provinces led to relatively high salinity (35–40 parts per thousand) in coastal waters, resulting in slow growth or even death of sea cucumbers. The production environment is also under pressure from anthropogenic factors, as seen by the 2017 prices of juvenile sea cucumber, production materials, related resources and labour force, which were on an upward and uneven trend. Production costs may lead to an intensification of this aquaculture, due to the high market demand.